Eva’s Village, a Paterson, NJ, anti-poverty, nonprofit organization, partners with local businesses to raise funds for its twenty integrated programs that assist those in need. Volunteers from Citrin Cooperman who participated at the gold level in Eva’s Village Fund-A-Meal program in June. The program is designed to engage corporate volunteers in a service project. "We look forward to continuing to help Eva's Village work towards ending hunger, homelessness, and addiction,” said Wilfredo Fernandez, a partner at Citrin Cooperman . Citrin Cooperman employees from the company’s Livingston, NJ, office returned in June to participate for a third consecutive year in Eva’s Village Fund-A-Meal program, designed to engage corporate groups. Organized around hands-on, team-building activities for volunteers, the program is also a sponsorship opportunity that provides vital funding for Eva’s Village Community Kitchen programs. Citrin Cooperman’s $5,000, gold-level sponsorship underwrites the cost of approximately two days of hot meals served daily, amounting to nearly 1,300 meals per day. “Eva’s Village depends on private donations and fundraising, which make up more than a third of our annual revenue,” explained Heather Thompson, Director of Development at Eva’s Village. Several Eva’s Village programs rely entirely on private donations, including the Community Kitchen, Eva’s free medical and dental services, and the childcare and education programs for the children living in Eva’s facilities. More than a dozen volunteers learned how Eva’s Village grew from a simple soup kitchen 34 years ago into the 20 integrated anti-poverty programs offered today. They also toured Eva’s facilities which span several city blocks before splitting into teams. One group helped serve lunch in the Community Kitchen, while the other picked up spades, rakes and wheelbarrows, working to mulch, plant shrubs and flowers to beautify the main courtyard. Employees already volunteering at Eva's, who were inspired by the nonprofit’s mission, programs, staff and clients, brought the anti-poverty organization to the attention of company officials. “We were looking for a way to really make a difference in the community,” said Wilfredo Fernandez, partner at Citrin Cooperman. “We are honored to have the opportunity to volunteer with Eva’s Village,” he said. Teams from Citrin Cooperman have been giving back at Eva’s for the past three years. “Our team is forever humbled by the daily efforts of Eva’s staff and volunteers on behalf of such an important cause. We look forward to continuing to help their organization work towards ending hunger, homelessness, and addiction,” he added. Citrin Cooperman is a nationally recognized, full-service accounting, tax, and consulting firm with offices located throughout the Northeast. The firm has a well-established tradition of giving back to the community. Their annual report notes, “Giving back is at the core of our philosophy as professionals, people and as a firm.” Their philanthropic activities include generous donations to community nonprofits, an annual day of service when teams of employees volunteer at more than a dozen charitable organizations, fund raising for charities, and a scholarship program. 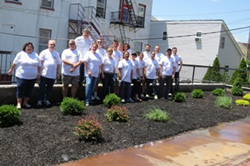 A team of volunteers from Citrin Cooperman work to beautify the main courtyard at Eva’s Village. Volunteers from Citrin Cooperman help serve lunch to nearly 400 guests in Eva’s Village Community Kitchen. Eva’s Village mission is to feed the hungry, shelter the homeless, treat the addicted and provide medical and dental care to the poor with respect for the human dignity of each individual.